Become certified in one of the newest and most rewarding areas of TESOL Teaching. English for Pre-school is packed with teaching activities, games and resources for the TESOL Teacher. The most fun you’ll have teaching! English for Pre-school covers the vital aspects of early childhood development including the cognitive and motor skill developmental stages. Teaching approaches and methods have been specifically developed to incorporate the growing needs of this tender age group. Full of games, arts and crafts ideas, songs, and rhymes. English for Pre-school will thoroughly prepare the TESOL teacher for the Pre-school classroom. Topics covered include: developmental stages, teaching techniques, classroom management for pre-schoolers, the classroom environment and topics to teach for each developmental stages. Q: What qualifications do I need to work in an Australian language school? 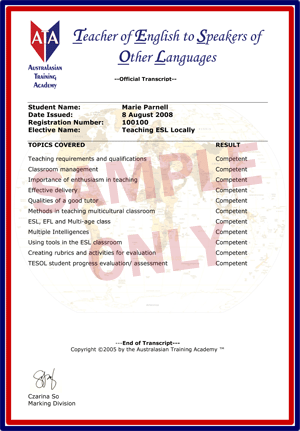 A: Teaching ESL Locally covers all areas of teaching ESL locally and necessary qualifications. Q: How can I find a home-stay student? A: This course will cover home stay programs and finding students.